I consistently get the following problem on Emacs 24.5.1 with folding package (version 20140401.3) for which I've found a workaround but would like to understand what was going on. Upon further investigation I noticed that this behaviour was dependent on the type of file I was trying to open with emacsclient. Some files triggered it, some not. Further digging pointed me to a message emitted by the folding package (version 20140401.3) when I was trying to open the offending files. … so I just use C-x C-b and navigate to my buffer to bring it up. And there is no mangling at all at the terminal. This leds me to believe that the problem may also be related to emacs daemon / emacsclient. was this problem related to emacsclient or folding mode ? how is it possible for emacsclient to mangle my terminal's output even after it's killed and how could I have fixed the terminal output? is there another way to solve this problem? I don't want to have to specify folding marks for JSON files because folding makes no sense in JSON. 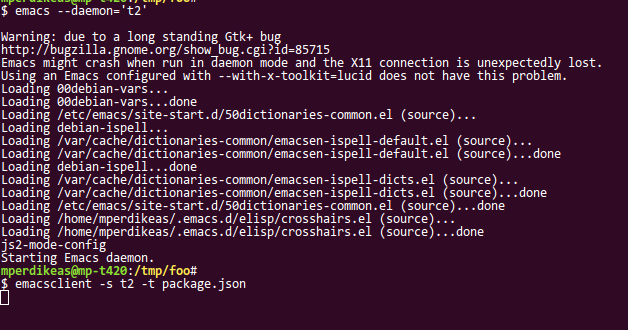 Browse other questions tagged code-folding emacs-daemon or ask your own question. Absolute fold level in Emacs? How can I replicate Vim's code folding?